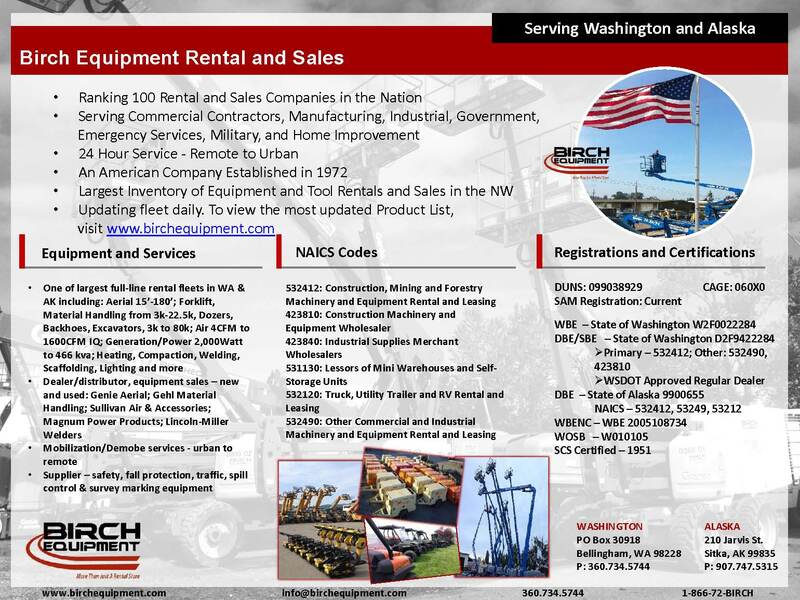 Birch Equipment was established in 1972 due to the need for a construction oriented rental company in Whatcom Co. Specializing in commercial construction, industrial, government and home improvement Birch’s rental & sales market extends seasonally from Montana to Western Alaska, stretching 6,000 miles. Birch has recently implemented Kaizen lean management into day to day culture, has multiple 20 years of employment celebrations coming up and is expanding into two additional brick and mortar locations. Birch regularly ranks in the top 100 rental companies in the nation. One of the largest inventories in the nation, from 125-foot boom lifts to 80,000 pound excavators. Birch has almost everything for projects big and small. From hand tools to lawn & garden, Birch has a huge inventory serving all levels of industry and homeowners. Birch can deliver to you and deliver your equipment for you. With 50+ GPS capable delivery trucks, Birch handles local, regional and national needs for customers. Full line of Lawn, Garden and Construction Products for the Homeowner to the Professional Daily User. Birch buys and sells equipment factory direct. You can buy new and used equipment with warranties included. 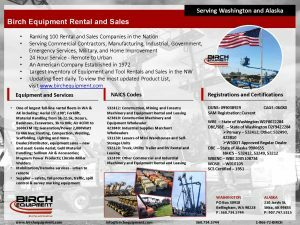 Everything in Birch’s rental fleet is for sale. Birch stores are fully stocked with pallets of safety glasses, shovels, gloves – anything you need to get the job done. Our product is accessible 24-7 and discounted pallets are available. Completing a one stop shop by letting customer know in advance that they are responsible for fuel usage, refueling is an additional service Birch provides to save the customer time. Birch will always send the equipment out clean to the jobsite, it is expected to come back clean as well. Knowing that customers don’t always have time to clean the equipment we provide a cleaning service. Birch is factory-certified to maintain and repair equipment. The Birch team can help with your scheduled maintenance and repairs. Birch mechanics are on-call 24/7 with multiple service trucks in all counties. Factory-certified training for Aerial Work Platforms and Telehandlers, company-wide training available.